Hi, my name is Dave Andrews and I’m the Chief Instructor of Family Martial Arts Centres’ Cadishead class, providing martial arts for adults, children and families in the Cadishead & Irlam areas. 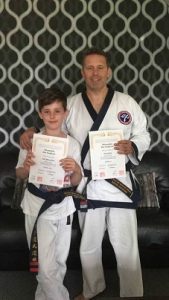 I started with my son many years ago and I know that martial arts is a great way to keep fit, improve your confidence and self-defence skills, as well as helping children with discipline and respect! To find out how I can help you and your family, please give me a call on 07904114483.